A new indoor market and events space will be created in a former Coalville pub, thanks to investment by North West Leicestershire District Council (NWLDC). The current market hall, which is located behind the Belvoir Shopping Centre, currently costs the council over £100,000 to maintain each year. The roof is leaking and some units cannot be used for health and safety reasons. £600,000 has been allocated by the council for the purchase and revamp of the building. 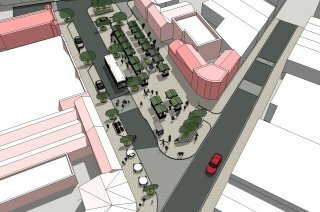 Councillor Richard Blunt, Leader of North West Leicestershire District Council, said: “Our plans to help regenerate Coalville include a complete redevelopment of Marlborough Square – and the relocation of the market is an important part of that. The current market is in the wrong place and is held in a cold, leaky building. We want to support our market traders and new business ideas in a welcoming space that can host markets, pop up events and entertainment.